Welcome back to Super Sunday, Snack n’ Pack. This week we have made yet another wonderful recipe using that very versatile loaf of bread, the baguette. We have made a super easy, tasty and fast appetizer with few ingredients that can be found at most grocery stores. 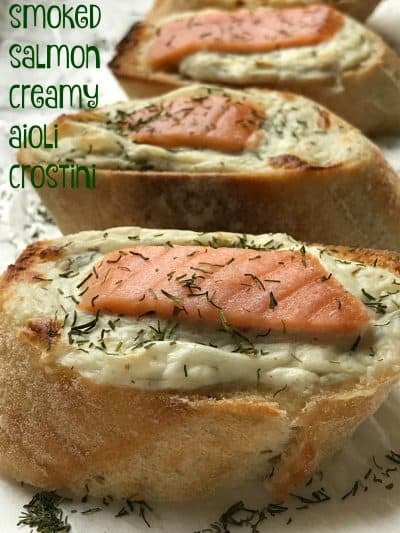 Smoked Salmon Creamy Aioli Crostini is perfect to serve during the big game. With only five ingredients, this recipe is sure to score a touchdown. For this recipe we used convenient store products, making this appetizer ready in under 30 minutes. We purchased Cold Smoked Salmon from Aldi. Cold smoked salmon is imported from Norway, ASC certified, deli sliced, salted and smoked with beech wood. I don’t recall the price but per Aldi, I’m sure it was reasonable. The salmon was used in this recipe and another recipe I’m working on for rangoon. The salmon has a delicious smoky flavor. The Lemon Herb Aioli sauce we used is by Stonewall Kitchens. Even though I have seen a version of lemon aioli sauce at Aldi, when I decided to make this recipe, much to my disappointment, I couldn’t find it. With my hubby on vacation this week, we made a trip to Menards, never a dull moment in my house, and I stopped at Schroeder’s Gifts in Antigo WI., a wonderful specialty store. I purchased a jar of lemon herb aioli from Stonewall Kitchen. Super delicious and perfect for this recipe. The remaining two ingredients in this recipe is cream cheese and dried dill weed, 2 ingredients I almost always have on hand. I like to lightly brush olive oil on the baguette slices and toast them slightly before spreading the slices with the cream cheese mixture. I do this with any crostini recipe I make. Crostini tend to become soggy after being allowed to sit out on a buffet or appetizer tray, so toasting the baguette slices first seems to alleviate that problem. Prosciutto and Herb Goat Cheese Crostini is another recipe you are going to enjoy. 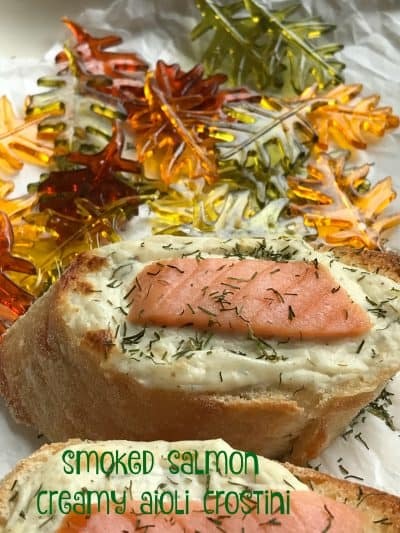 Smoked Salmon Spread is also a fantastic recipe using smoked salmon. 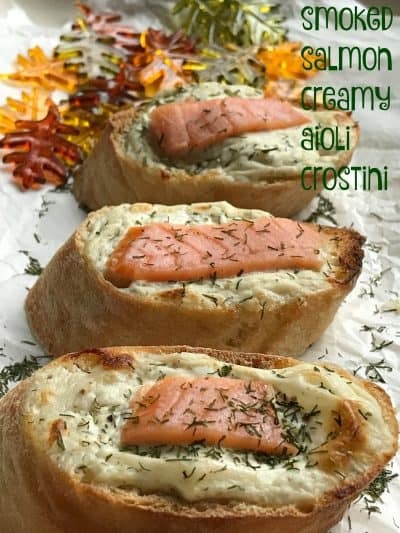 Baguette slices are topped with a cream cheese and aioli spread, then topped with thin slices of cold smoked salmon and dried dill. In a small bowl, combine cream cheese, lemon dill aioli sauce and 1/4 teaspoon dried dill. Set aside. Slice baguette on a diagonal into 1/2 inch to 1 inch slices. Brush lightly with olive oil. Place baguette slices on a baking sheet lined with parchment paper. Place under broiler and toast slices slightly. 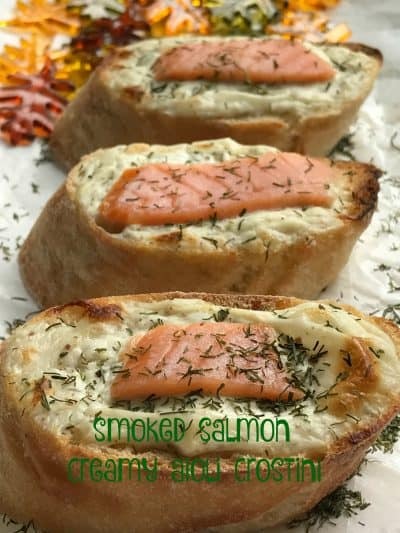 Slice cold smoked salmon slices into 16 pieces about the same length as the baguette. Set aside. Spread lightly toasted baguette slices with cream cheese/aioli mixture. Place one piece of smoked salmon on top of cream cheese mixture. Broil (6 inches under broiler coils) for 1 or 2 minutes, watching carefully. Remove from oven, sprinkle with remaining dried dill weed. Serve.